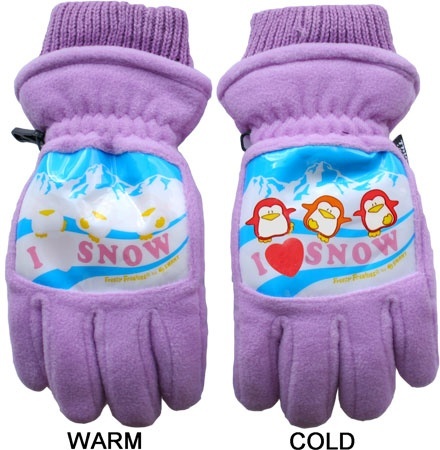 Freezy Freakies, the magical gloves from the 80s that broke young minds when they revealed hidden images in the cold! Freezy Freakies were born in the 80s and they were snow gloves that used a HIGHLY advanced special magical ink that changed color with the temperature. The ink would stay invisible at room temperature and show up in the cold, like Hypercolor, but in reverse. My friend said that she and her friends used to lick them to bring the color out faster. I threw her a side-eye of judgement for that while remembering how I used to fart on my Hypercolor t-shirt to bring out the color faster. They originally only came in kid sizes and when the greatest decade in the 20th century went away, so did Freezy Freakies. BUT earlier this year, the souls of 80s kids who grew up in the cold were covered with a thick layer of icy happiness when Freezy Freakies announced its return! You can now buy a pair of Freezy Freakies and they come in adult sizes for the first time in history. Now all I need is for Hypercolor to come back and make crop sweaters. When I pair a Hypercolor crop sweater with some Freezy Freakies, snow boots, a scarf and shorty shorts, I’ll have the perfect Southern California winter ensemble!